If you had a great year and are looking to get a sizeable refund back, you may be audibly screaming, “YAS,” and plotting how you’ll be living your best Cardi B life when the check finally comes in. But for the approximately 33 percent of Americans that file their own taxes each year, the process can be stressful. Luckily, there is TurboTax, which has simplified the process and saved many of us from having a full breakdown each new year. To kick off the new tax season, TurboTax launched a one-of-a-kind video campaign that is giving consumers the chance to share how doing their taxes makes them feel for the chance to win! 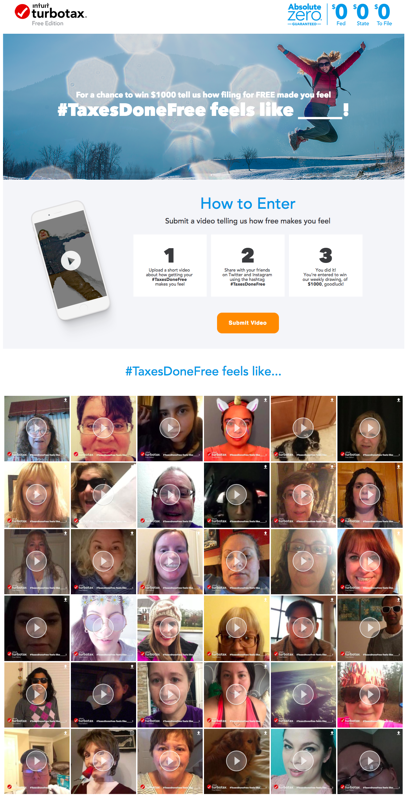 TurboTax’s #TaxesDoneFree video contest encouraged consumers to create and upload a short video about how doing their taxes for free made them feel. TurboTax chose to run a weekly prize drawing where they rewarded one consumer a prize of $1,000 for sharing their tax story. TurboTax’s campaign is a perfect example of a well-rounded campaign that saw great success thanks to their smart use of video and the quality of submissions. 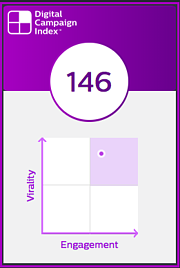 TurboTax’s DCI score is a combination of an Engagement Score (ES) of 125 and Virality Score (VS) of 167. Their #TaxesDoneFree contest made great use of co-created video content to encourage sharing and engagement. Let your consumers get personal. More so than photos, video offers consumers the chance to open up and get personal with a brand. Having consumers speak to what they love is a powerful tool for building brand loyalty and increasing engagement on your website, as consumers scroll and click through the video gallery. Add a video gallery. 55 percent of consumers watch video online every day and adding a video gallery to your campaign page is a great way to increase the time consumers spend on your site scrolling and clicking. Video is red hot. Video is still having a major moment, and brands and marketers are in a great position to leverage enthusiasm for video to activate consumer sharing and reach new and existing audiences across paid and owned channels. It all comes down to the framing. TurboTax created custom branded video frames as overlays for the videos submitted. Branded frames are a great way to tie content being shared back to your brand and campaign. The rise in video is giving brands and marketers the opportunity to engage consumers in co-created digital campaigns that offer high pay off in terms of virality and engagement, and TurboTax’s #TaxesDoneFree video contest is the perfect example of how video can and should be used. So, if you haven’t yet, head over to TurboTax’s campaign website to view their video gallery and check out some of the amazing video testimonials they were able to collect! Learn more about how you can launch a Branded Video Filter campaign here.